How does Google view word count? The question came up in today’s Webmaster Hangout with John Mueller about whether there is a minimum word count on a page or not. The answer is no, there’s not. This is something I said in my Google Panda article, with an example of a page with a featured snippet, while having less than 140 words on the page. But many “experts” say that pages must have a minimum of X words – usually in the neighborhood of 250 or 300 – in order to rank well. This is something John Mueller has also repeated previously. I don’t know specifically about the scorecard, how that’s set up, or how the Google News guidelines are in general. 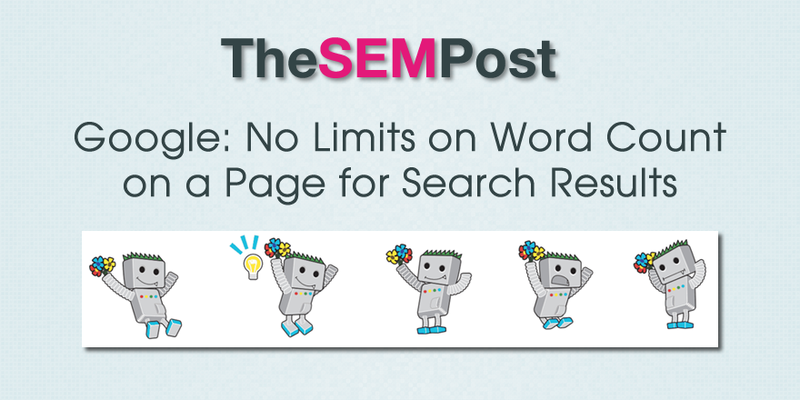 But in practice from a web search point of view, we don’t have limits on the number of words you can have on a page. It can even be that your page is blocked by robots.txt and we see no words at all from that page. So that’s something where it doesn’t really matter how much actual words you have on the page. And if you have information like a scorecard, or a table of numbers that those numbers are relevant to the user’s query, then we’ll try and show that, even if there’s not normal text on the page. So focus less on meeting a mythical number of words on a page, and focus on high quality and unique content that searchers want to find.